What is VoIP Call Center Software? VoIP call center software is a call center software system that relies on Voice over internet protocol (VoIP). VoIP is a commercial communication technology that uses internet protocols to interchange calls between two parties. Basically, call centers used to rely on the traditional way of communication which was wire based. After VoIP technology came, large and established enterprises tried to use VoIP to make commercial calls. If you Skype, you can understand how easier it is to make calls to any part of the world. While using Skype you do not need to deploy any bulky hardware but install an application and start making calls from your PC. Here the flexibility and speed of the internet allow you to beat any old-fashioned analog phone system. Therefore VoIP call center software can be seen as an advanced innovation to provide solidity to contact centers. Voice over internet protocol (VoIP) is a technology that needs open source based applications to function effectively. Open source framework is a type of software that is free to study, distribute and change. There is numerous open source software that is used in the VoIP development process. VoIP development is done to create mobile-friendly applications for efficient call center communication. With VoIP call center software it will become easy for call centers to establish secure and hassle-free client-agent communication process. There are many benefits of having a VoIP call center for a small business. There is various call center software like predictive dialer, bulk SMS software, and voice broadcasting software that require effective IP based technology. As VoIP is not a discrete set of technology it enables effective enterprise-grade communications at contact centers. VoIP (Voice over Internet Protocol) technology allows businesses to reduce expensive hardware deployment. VoIP call center software broadcasts voice messages or generates voice calls at very cheaper rates than traditional telephony system. VoIP technology allows SIP to function under it which makes it simpler for call centers in delivering good services to customers. VoIP technology works with various open sources frameworks like Asterisk, Opensips, FreeSwitch and WebRTC to build mobile-friendly applications. The VoIP call center software of Sip2Dial has various advanced features like skill-based routing, ACD, customized call queues. VoIP call center software is affordable than traditional telephony system. VoIP technology is a superior grade innovation that boosts the efficiency of your agents. VoIP call center software is cloud-hosted, so your data is safe in case of any virus attack. Sip2Dial’s VoIP call center software allows phone calls managed effectively. 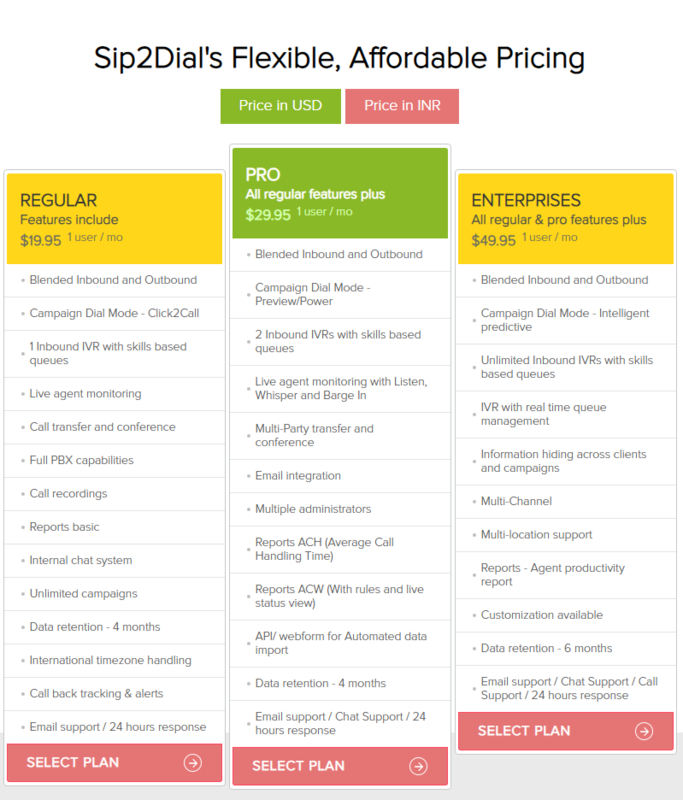 Sip2Dial utilizes moved servers and techniques to give stunning consider end all around the world. Call end is the place the VoIP call is guided between the provider and the called party. In the event that there ought to be an event of VoIP, not all providers are made the proportionate. You need to scan for a supplier with awesome call end and Sip2Dial is unmistakably a fantastic decision for you. At easy to refute costs, Sip2Dial gives High-quality call end office which gives it an edge over its adversaries. With Sip2Dial’s VoIP call center software small businesses can conduct active monitoring process in their call centers. Nevertheless, Sip2Dial accepts this as an imperative piece of VoIP innovation. Sip2Dial effectively screens call end courses in the event of any issues. If your business relies upon VoIP innovation, you can’t hold up under the cost of a poor VoIP supplier rather you require one of the best VoIP suppliers in India. For a reliable VoIP call center software provider, it is important to have a good international brand value. In case you are looking for a good cloud-based call center software provider, there is no better option than Sip2Dial for you. Sip2Dial’s best VoIP call center software allows call centers to operate flexibly without the stress of maintenance and extra hardware installation. Most small businesses in India endure outrageous misfortunes due to their little knowledge of advanced technologies like VoIP, SIP and cloud-based technology. On the off chance that you need to contact a dependable VoIP call center software provider you should make sure that your provider is strict against such illicit exercises. Sip2Dial successfully screens calluses of clients like banks screen their cardholders. This makes countless handle the phony activity.